The Minnesota State Law Library is the oldest continuing library in the state of Minnesota and also one of the state's oldest institutions. The Library and the Territory of Minnesota were created by the same act of Congress on March 3, 1849. Section 17 of the act provided a $ 5,000 appropriation to establish a library that would be located at the seat of government. 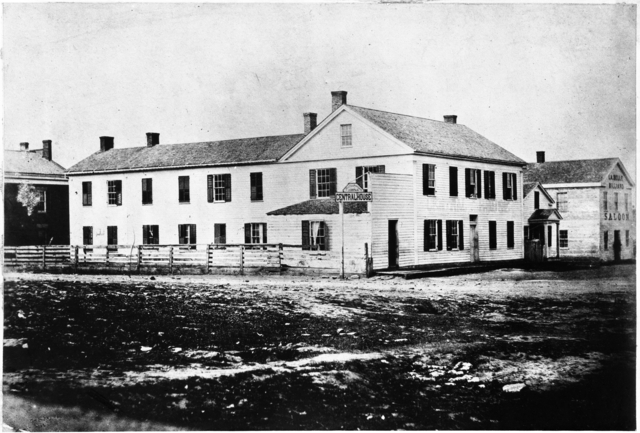 The Library was set up in the summer of 1849 in a small candlelit room on the second floor of St. Paul's "Central House," a tavern that also functioned as the home of the new territorial government. In the early years of the Library's existence, the collection included a wide variety of miscellaneous titles. However, in the 1870s the Supreme Court assumed responsibility for the Library and began to form a collection emphasizing law and the theory of law. Books on other subjects were transferred to the Minnesota Historical Society and the University of Minnesota to supplement their collections. In its long history the Library has benefitted from the contributions of 26 State Law Librarians, who have come from many different backgrounds. Doctors, journalists, teachers, legislators, mayors, and in recent years, attorneys have held the office. Some of the more colorful State Law Librarians have been General Samuel P. Jennison, who later served in the Civil War; Louisa Goodwin, the first woman state librarian in the United States; Captain DeWitt Smith and his wife Melissa Smith, the first husband and wife to hold the same state office in Minnesota; and William Henry Harrison Taylor, a grandson of President Harrison. The Library has been located in a log tavern, a hotel, a market, in three State Capitol buildings, a former Ford Motor Company factory and showroom, and, since 1990, on the ground floor of the Minnesota Judicial Center. The Library has suffered three major fires and two large floods that nearly destroyed the collection. It has progressed from a small, candlelit room with one table to a modern, efficient, full-service law library occupying over 33,000 square feet and containing over 400,000 traditional and electronic resources. From its humble beginning to the present time, the Minnesota State Law Library has been committed to the challenge of organizing and maintaining a collection of materials that meets the varied, simple and complex legal research needs of its users. Today, the Library is one of state's principal legal resource centers serving the judiciary and all branches of state and local government; the legal profession; other law, public and academic libraries; and the general public. Curt Brown, Two Civil War widows became pioneering librarians Star Tribune, March 30, 2019.